Abstract Void shouldn’t work. This project, exploring the dark and atmospheric place where black metal and synthwave unexpectedly meet, is; however, ABSOLUTELY thriving. This is made evident by the arrival of Back to Reality, the second sonic encounter from this one-man band. Prepare yourselves accordingly; the cataclysmic eminence of the apocalypse is here with the sophomore release from Abstract Void. No longer is this sound an experiment. 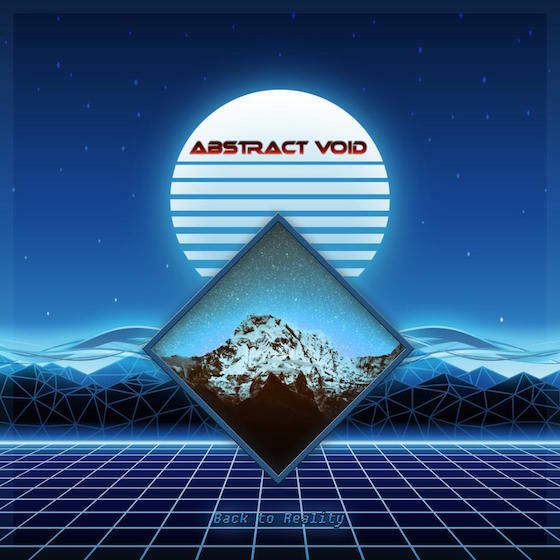 With yet another strong cycle of songs and an unshakable immersive quality to the production and the spectral howl of that voice as it shreds through topics of love and loss and all the glories therein, Abstract Void shows no signs of stopping anytime soon. Thank the Goddess. "Prepare yourselves accordingly; the cataclysmic eminence of the apocalypse is here with the sophomore release from Abstract Void. No longer is this sound an experiment"
Back to Reality is a seven-song cycle through some artfully atmospheric blackgaze that has been syphoned through some fairly ethereal-spiking synthwave. Should your tastes run the scope like mine do, you will love every shimmering minute of this black tidal wave as it washes over your senses. The journey into the unknown gets started with the cool foundation of synths as “Wind of Reminiscence” takes flight. It is soon shattered by the head crushing cement of shredding guitars. There is an opaque beauty sewn into the structure here. This is made insanely clear by the brain-damaging splendor that is “As I Watch the Sunset Fade”, a song that simply slays its way across the universe. Space operatic synthwave? Listen to the title song “Back to Reality” or even “A Reflection of Dying Past” and tell me otherwise. Following the dreamlike “Disconnected”, we get the metamorphosing bliss that is “Joy Night” and, within mere seconds, this epic song successfully proves that a fusion between 80s-inspired sounds and the sonic tempest of metal is absolutely possible and, of all things, NEEDED. The expressive howl of the vocals in this song lets the air in; sunlight is cast about and seams are shown. The sounds that Abstract Void produces, complete with electronic beats and other electronic stylings, isn’t a musical oddity. This is a REAL band. For once, especially with the arrival of “Sigh”, we see the whole of this project – not just the isolated parts as two differing landscapes become joined – and we are left speechless. There is a brutal purity to these songs that, thanks to engaging songwriting and hook-laden structures, bulldoze their way through nostalgic-sounding synthesized chord progressions and, for extra weight, rich arpeggios. The result of such ragged and euphoric cycles makes for an unforgettable smattering of righteous synth-static black metal. Back to Reality won’t soon be forgotten.